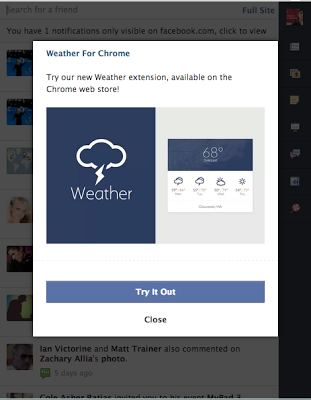 Just opened Facebok for Chrome , and got prompted by the below interstitial modal announcing 64px.com's latest app: Weather for Chrome. So of course i got the app, since 64px.com only makes the best chrome apps :) The new Weather app is great. Recommend you go get it. The app is dead simple , requiring zero user input or set up. It is ultra clear to read at a glance. The icons are tasteful and clear. I am a fan of various weather apps , Currently for example. 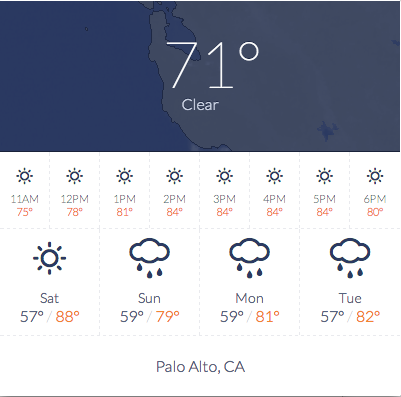 Also Awesome Weather for Chrome (an app i made, but stopped supporting due to Google shutting down iGoogle's unofficial weather API which powered it). Weather from 64px.com is one of the best, if not the best.